One of the most effective types of therapy for addiction treatment takes place among your peers in recovery. Group therapy treats substance abuse, addiction, and associated psychological disorders. In group treatment, you explore topics common to your addiction, gain insight about yourself through others’ eyes and learn from the experiences of your peers. Although group therapy isn’t easy at first, you soon look forward to your sessions and what you gain. Group therapy is a type of counseling. It involves a schedule of sessions with at least one therapist guiding several participants through education and support for their common disease. Members of the group play a major role in its success. 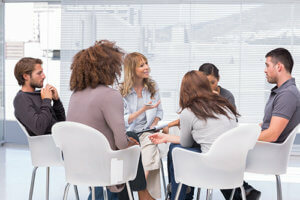 Together with other types of therapy, group proves to be an effective treatment for addiction. One of the purposes of group counseling is reducing members’ symptoms to help them achieve recovery. This recovery takes place under the therapist, who ensures individuals meet specific goals in each session. Group therapy takes place in a variety of settings. People in many types of rehab programs participate in group therapies, including those in inpatient and residential rehab, intensive outpatient treatment, outpatient programs and partial hospitalization. People wanting lasting recovery find group treatment extremely helpful. After all, group therapy exists for ending drug use and maintaining sobriety without relapse. According to leading experts, group therapy achieves this as well as individual counseling, if not better. Group counseling provides many benefits. These benefits include helping members learn how to build healthy relationships based on trust. The participants learn they have support from people traveling the same path. This builds confidence and self-esteem while reducing stress, guilt, and pain. In group therapy, members learn how to stop behaving in destructive ways. The therapist provides enough guidance during these sessions for continuing progress and self-awareness. Members also learn about the recovery process, motivate each other and gain problem-solving skills. One of the greatest benefits of group treatment is its quick availability to people looking to recover. The group setting means more people gain treatment at once, cutting down on wait time for therapy. Group fills gaps between individual counseling sessions and expands on what you learn through one-on-one therapy. To get the most out of group therapy, you need to match with a group that best suits your individual needs. Your rehab program gives you the greatest potential for a strong fit. In rehab, your group fits your treatment preferences and personal needs. It also fits your emotional stability and recovery stage. Near Houston, Texas, Woodlands Recovery Centers provides the therapies you need for strong, lasting recovery. Through Woodlands Recovery Centers therapies, you learn your reasons for abusing drugs or alcohol in the first place, tools to stop your substance abuse and skills for preventing relapse. All of this treatment for addiction takes place in a serene setting where you gain the peace you need to focus on recovery. If you or someone you love need lasting recovery from addiction to drugs or alcohol, Woodlands Recovery Centers provides the substance abuse treatment you need. Call Woodlands Recovery Centers at (855)752-3377 for more information about available programs.